What you see in today’s passage is the highest compliment any human being can get. It was more than Usain Bolt and more than Michael Phelps, much more than what is given to almost super human beings. I watch the Olympics. I enjoy it thoroughly. Bolt did not run like human being, he ran like a horse. Just amazing. They were amazing. But what Peter got was a much bigger compliment. Jesus said, He would give him the keys of the Kingdom of Heaven. He said, “whatever you bind on earth will be bound in heaven. Whatever you loose on earth will loose in heaven”. What kind of amazing privilege is that? What kind of power? The keys to the kingdom, the keys to heaven! That is amazing authority, power, privilege, compliment and praise he got from Jesus. Jesus gave him a new name. He was Simon sort of Jonah, but Jesus said, now you will be called Peter, which means rock. He said, “I’ll build my church on the rock”. That is a high privilege, glory and compliment that he got. I wonder what Peter would have thought at that time. I don’t think Peter had any idea of what Jesus was talking about. He probably had an open mouth and was wondering, ‘the keys to the kingdom? On me? You’re going to build your church? What does that mean?’ Peter probably didn’t even understand what Jesus was talking about. Peter, whom we know, he was unlike a rock. His name was ‘rock’. The name was given to him, but he was not like a rock. The name ‘rock’ didn’t really suit Peter. He was flimsy, he was very influenced by circumstances. He was a wishy washy person. At one moment he was saying one thing and the next moment here would do something totally contradictory to what he said. He said to Jesus, “I’ll follow you to death”, and as soon as the situation became very difficult, he denied Jesus three times. Simon was not at all like Peter the Rock, even though he was given that new name. I mean he did all this after he was given the name ‘rock’. So I wonder what Jesus meant when he said to Simon, you are Peter, because he was not like Peter. What did Jesus mean when he said that you are Peter. I reflected on this, and I realized that what Jesus really meant was, “I will make you a rock”. I’ll make you Peter. You’re Peter now and you will become like Peter. You may feel that that’s not the end of it. You are still Peter and you will become Peter. Often we get discouraged about ourselves. We are affected by our circumstances. Sometimes our existence is so flimsy, we go back and forth, up and down. We don’t have a solid existence. We don’t have a solid life. Sometimes we are on very shaky ground and our emotions go up and down. Sometimes we feel good when we do well and we feel positive about our life. We feel confident that we can do almost anything. But when we fail, when we don’t do very well, we get so negative about ourselves. We get so negative about our life, we just don’t have confidence. We go up and down. Sometimes we even have four seasons in a day. We feel great at one moment. The next moment we feel so lousy. We’re not like a rock, we are not solid. Look at Ryan Lochte. He got many medals. Once he even beat Michael Phelps. Even at these Olympics, he got the gold medal. He was at the top, the peak of his career and his glory, but on the way back to the Olympic Village, he had his friends vandalized the washroom of a gas stations and he lied. He said, “I was wronged at gunpoint”. The whole world was shocked. They thought that an Olympic gold medalist was robbed at gunpoint, but he lied just to cover his bad behaviour. He lost all this sponsorships. He doesn’t have sponsorships anymore. I don’t know if he can come out to the next Olympics. We are weak and fall short of God’s glory, but my friend, our solid foundation is not our strength. Our solid foundation is God’s desire to help us and make us the person who we’re meant to be. Our solid foundation is not on me. Our solid foundation is on God’s desire to me into Peter, the rock. Peter did not become Peter by his own strength or because of his good solid personality. Peter became Peter because of God’s endless desire to make him Peter. If you don’t give up, God does not give up on you, but if you give up, even God cannot help you. Where is your solid foundation? You know my biggest problem of modern generation and the biggest problem of this generation is narcissism. I think that is the greatest problem. We have to fight against it. When things are going okay, that’s fine, that’s good. But once you start failing, you start losing yourself. Narcissism cannot lift you up, it cannot save you. That’s the problem of narcissism. 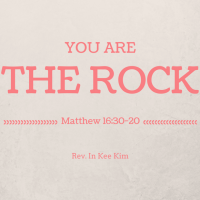 You are the rock, not because of who you are, but because of who God is. You’re the rock not because you don’t fall or fail, but because God does not give up on you. On you, God wants to build his church. Now we have to have confidence in our life. God gave you so much power and authority and God called you to be the rock, to be solid, don’t live by how you feel about yourselves or with the identity of the people imposed on you. Don’t let the world get you down. Don’t let your mind get scattered, you must have sharp focus like a rock and not like quicksand. What do you stand on? On yourself? Or on the God who never gives up on you as you strive to become the rock? I try my best in Ministry but many times I feel that my best is not enough. I fail, I get discouraged. I get discouraged about myself when it comes to Thursday. I get very anxious because the message does not come easily. I wait and wait, study and study but still the message doesn’t come. Even yesterday even, I told my wife “I’m in trouble. I have no message to speak tomorrow”, which was Sunday. I have to wait. I get discouraged about myself and about my performance all the time, but I will not let myself down. I’ll try my best, but at the end of it I will always go back to God, who never gives up on me. No matter what happens to me, I’ll still go back to God at the end of it because God is a solid foundation, not me. Not my ability, not my intelligence. God is a solid foundation and I need to continuously go back there and pick myself up again and stand up. If I use myself is a foundation, I have lived my life on very, very shaky ground. If you have this foundation, you will not have hope. Even when you are helpless, when you feel that you’re not good enough, if there is faith of a mustard seed, then you will have hope. That hope will not disappoint you. That hope will bring you back to be able to stand and move on with your journey. But when you trust yourself, when you are down then everything crumbles, everything dies. When you have the faith of the mustard seed, even when you are down, you will not lose hope and that hope will make us strong. That is your foundation. Have the faith of a mustard seed. Just because you fail, don’t give up. Look to God and you’ll see hope. That’s good news. The good news is that my life is not just based on me. My life is based on God’s desire to make me who I’m meant to be. When I look at all of you, there is so much talent, so much ability. But we need more character to be able to persevere, to continuously persist, and to reach out for a dream that you have. I hope that through that faith, you build that character. The bottom generation was lacking in intelligence but our generation was lacking in character. If you’re narcissistic, you’d never build character. When you have faith, you’ll able to start building your character and that character will carry on. We all fail, we all get discouraged, we all fall, but who’s going to stand up and carry on? The one who has faith in God’s desire to want to help you. I hope that we all build that character in our lives.